Summary: By the time you reach foreclosure, the bulk of the damage to your credit has been done. The foreclosure will be on your credit report for seven years, but with diminishing importance. If you miss your payments for an extended period of time, you could be at risk of foreclosure. 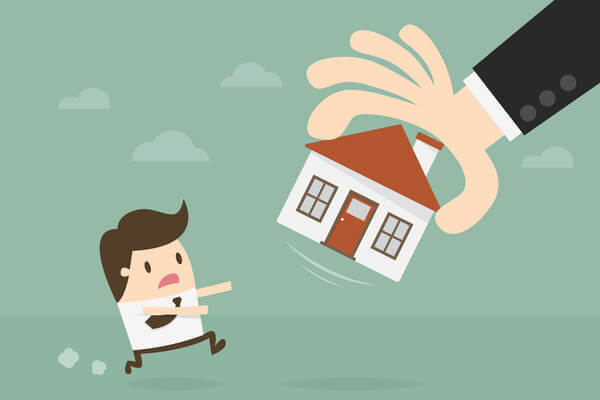 Foreclosure is a legal process in which you forfeit all rights to the property, and the lender takes possession of your home. Here we look at how it affects your credit, the foreclosure process, and some alternatives to foreclosure. FICO (the Fair Isaac Corporation) did a study to determine how mortgage delinquencies such as late payments and foreclosures impact credit scores. In the 2011 study, they looked at three hypothetical consumers with credit scores of 680, 720 and 780. The study found that the consumer with the highest initial credit score saw the biggest hit to their FICO score following a foreclosure, with a drop of up to 240 points. Meanwhile, the credit score of the consumer with the lowest beginning credit score saw a decline of 150 points. However, some of that damage actually happened before the foreclosure took place. According to their research, when a homeowner is 30 days late on their mortgage, their FICO score could drop by anywhere from 80 to 110 points. At 90 days late, the score may have fallen by 80 to 130 points. These findings are supported by a study performed by the Federal Reserve Bank of Cleveland in 2016. In their report, author Yuliya Demyanyk writes, "the very first missed mortgage payment leads to the biggest reduction in credit scores. The effect of subsequent loan impairments on the credit score is increasingly muted." In other words, while a foreclosure will negatively impact your credit score, if you’ve missed several mortgage payments, your score has already taken a hit. Whatever the immediate effect of the foreclosure, it will stay on your credit report for seven years. However, the impact of the delinquent payments and foreclosure will diminish with each year that goes by. The Federal Reserve Bank of Cleveland study noted borrowers typically see a significant improvement in their score one year after foreclosure. Why? The study says, "the absence of mortgage payments relaxes the borrowers’ budget constraint, allowing them to restore other forms of credit." According to Attom Data Solutions, foreclosure filings were reported on more than 676,000 U.S. properties in 2017. That’s a 76% decrease from the peak of nearly 2.9 million in 2010. Faced with the loss of your home, you may be wondering how foreclosure will impact your credit score. Here’s what you need to know. The foreclosure process varies from state to state, but in general, you can expect the following. Before a lender can start the foreclosure process, you have to default on the mortgage. After the payment due date, you generally have a grace period of up to 15 calendar days to make your payment without a penalty. After that, you will likely receive an influx of emails, letters and phone calls from the lender. Once you’re 30 days late on your mortgage, your lender may report the delinquency to the credit bureaus. If their efforts to work out a resolution to your missing payment fail, the lender will issue a Notice of Default. This form is sent via certified mail. The timeline for foreclosure varies from state to state, but most lenders start the foreclosure process about three to six months after your first missed mortgage payment. They will issue a notice of sale, notifying you that they intend to sell your home at auction within 21 days. If you don’t come up with the money to keep your home, it will be sold to the highest bidder at a public auction. If it doesn’t sell, the lender will own it. Whether the property is sold at auction or kept by the lender, if you are still living in the home, you will be asked to move out. If you refuse, you can be evicted. Forbearance: For temporary hardships, your lender may agree to a reduced payment plan in the short term. See how forbearance can affect your credit score. Repayment plan: If you missed a few payments but can afford higher payments for a few weeks or months, you may be able to bring your mortgage current. Modification: If a change in your financial situation means you can no longer afford your mortgage, the lender may be able to modify your mortgage into a more affordable payment. Short sale: If your mortgage balance is more than the home is worth, you may be able to sell it and get your lender to forgive the difference between the sales price and your mortgage balance. This will also negatively impact your credit score, but you avoid the costly and time-consuming foreclosure process. See how a short sale can affect your credit score. Deed-in-lieu of foreclosure: You agree to turn the property over to your lender rather than go through the foreclosure process. If you can’t make your mortgage payment, don’t just sit back and let late charges, delinquent payments and foreclosure trash your credit score. Contact your mortgage servicer or a housing counselor to talk about your options. If you’re proactive, you may be able to keep your home or minimize the damage to your credit score. Janet Berry-Johnson is a Certified Public Accountant and personal finance writer. Her work has appeared in numerous publications, including CreditKarma and Forbes. Should you buy an old or new house?